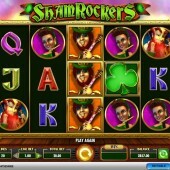 Apart from the theme, Shamrockers Eire to Rock is a very typical IGT slot. It has 5 reels, 20 paylines and definitely measures on the high side when it comes to volatility. This is largely due to the bonus features, which I will explain more about later in this review. The reels contain a variety of symbols that include the band members, known only as Fiddler, Guitarist, Singer and Drummer. Add to this a 3-leaf clover as the Wild symbol, a ticket stub as the bonus trigger and your usual array of A-K-Q-J-10. It is also worth mentioning that this upbeat Irish-rock slot is packed with bursts of fiddle music. Something that got a bit tiresome for me when playing this slot over a long session. 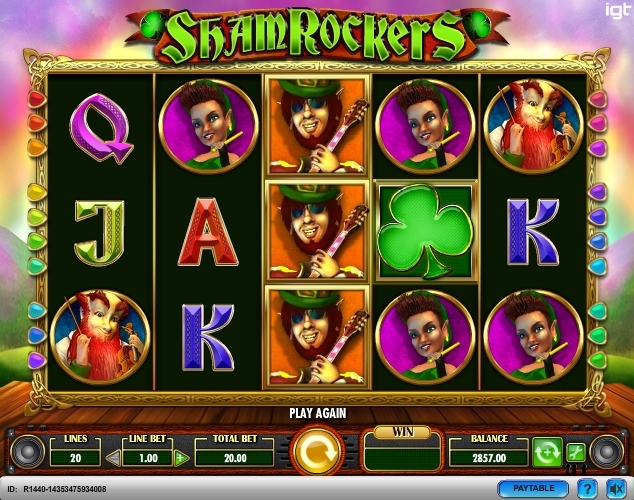 The Dynamic Stacks feature in Shamrockers Eire to Rock provides winning opportunities in every single spin. Each reel has a large stack of same symbol – band members only. A symbol is chosen at random on each spin and will fill every reel’s stack if it matches those symbols that land in place. This is easier to understand when you are playing and relies mainly on the luck of the random selection. The free spins bonus in Shamrockers Eire to Rock is triggered when the bonus scatter appears on reels 2, 3 and 4 at the same time. This will trigger 4 free spins (which sounds a bit stingy), but trust me it gets better. Each spin includes a different band member, starting with the Fiddler, followed by the Drummer, Guitarist and finally the Singer (in order of their level of reward - low to high). They can appear in Dynamic Stacks offering some sizable rewards. On the 4th spin look out for the Encore symbol on last reel. If it appears you will trigger 4 more free spins and the cycle is repeated. This can re-trigger multiple times offering a maximum number of 240 free spins. This quirky, uplifting slot has a nice mix of risk and reward and will certainly appeal to the high volatility players. The theme is original, despite it following the heavily overused Irish theme that is present in many slots, which is some credit to IGT. However the constant sound bites of the fiddle playing rock band can get tiresome in long playing sessions. There is an easy remedy to this, which involves a simple click of the mute button. If Shamrockers Eire to Rock is your sort of game then you might also want to take a closer look at IGT’s Megajackpots Isle O’ Plenty (which includes a very large progressive jackpot). If you want something that is just simply Irish themed then you can’t really go wrong with Ash Gaming’s Leprechaun’s Luck.